Priscilla Cecilia (née Moore), Countess Annesley (1870-1941), Second wife of 5th Earl of Annesley; daughter of William Armitage Moore. Sitter in 48 portraits. Jannette Desborough, Actress. Sitter in 1 portrait. 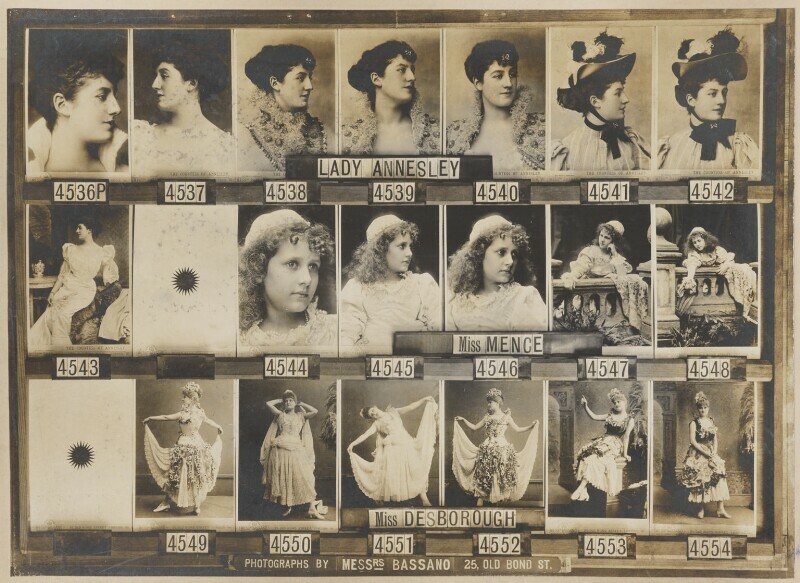 Miss Mence, Actress. Sitter in 1 portrait. Gladstone's fourth and final term as Prime Minister begins, and is again dominated by the issue of Home Rule as he attempts to push through the third Home Rule Bill. The first Indian MP, Dadabhai Naoroji wins the seat for Finsbury Central, and Keir Hardie becomes the first MP for the Independent Labour Party, winning the seat for West Ham. William Butler Yeats forms the National Literary Society in Dublin, and also publishes The Countess Cathleen, a short play and his first contribution to Irish poetic drama. Rudolf Diesel is issued a patent for his internal combustion engine; Diesel's engine eventually replaces steam power. The Nutcracker, based upon a story by E. T. A. Hoffman, composed by Pyotr Ilyich Tchaikovsky has its premier in St Petersburg. Fifteen year old Annie Moore, from Ireland, is the first person to enter the United States through Ellis Island, newly opened as the point of reception for all new immigrants. Between 1892-1924, more than twenty million immigrants passed through Ellis Island. The Falkland Islands, east of the South American mainland, become a British colony.